The Baby Einstein Neighborhood Friends Activity Jumper will captivate your baby. 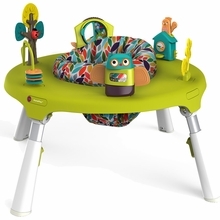 With 360 degrees of multi-sensory activities, your baby can swivel and play every which way. The activity center features 3 play stations and more than 12 activities to explore. The baby bounce chair allows your little one to jump and dance, which helps strengthen their developing leg muscles. Enjoy plush playtime on our big, cozy cloud. Offering hours of plush playtime, it features a soft color palette, five celestial-themed hanging toys will engage baby with lights, music and other stimuli. Entertains baby with bounces and delightful learning toys. PortaPlay also folds flat for maximum portability and minimum storage space. Converts easily to a Play Table and more for a product that always surprises.